Four Mile Run Green Infrastructure Project Moves Forward! After months of residents speaking up in support of the Four Mile Run watershed green infrastructure project, Mayor Peduto and others fully funded the design of the project! The Four Mile Run project will help to mitigate flooding in The Run, remove CSO from the rivers, and bring other environmental benefits back to the watershed. Not only is this project critical for the watershed, but it will also help our region prove to the EPA that a green-first approach can work to solve our CSO problem. In 2018, both Four Mile Run and Negley Run are set to be funded and designed – now we must make sure that all stakeholders chip into these projects and get them built as soon as possible. Stay tuned for more updates and events from the Clean Rivers Campaign to see how you can help make these projects a reality! 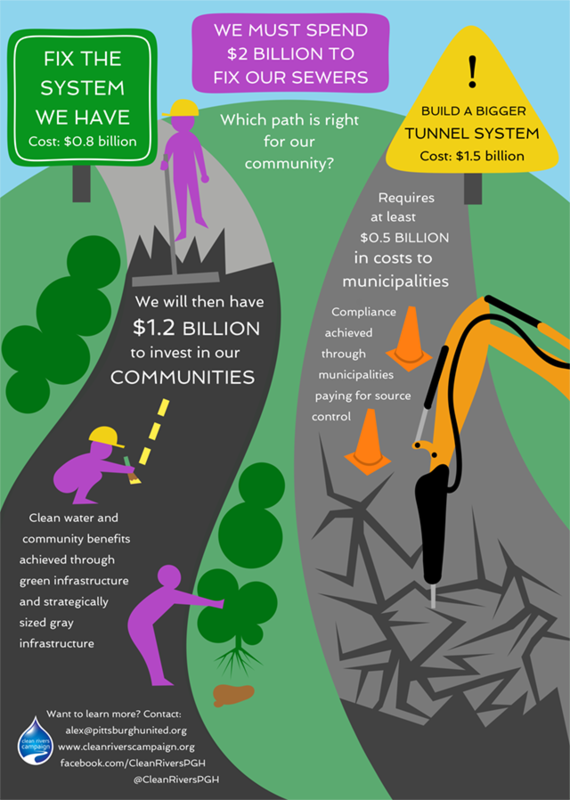 Two Paths to Fixing Our Sewers – Which would you choose? Be sure to stay in touch with the Clean Rivers Campaign on Facebook and Twitter. If you have any questions or need more information, please call 412 – 231 – 8648.